In Iceland, tourism has grown rapidly over the past decades, with just over 4,000 foreign visitors in 1950 increasing towards 1,289,140 visitors in 2015 (ITB, 2015). While, in comparison with many other countries, 1.3 million visitors may not seem excessive, this number almost quadruples the Icelandic population. A flourishing tourism industry in Iceland provides a welcome economic stimulus for the country. This tourism industry is largely dependent on the natural beauty of the Icelandic landscape and its attractiveness for recreational purposes. The landscape forms the primary drawcard for visitors to go to Iceland and thus represents not only nice scenery, but also a high ecological and economic value. 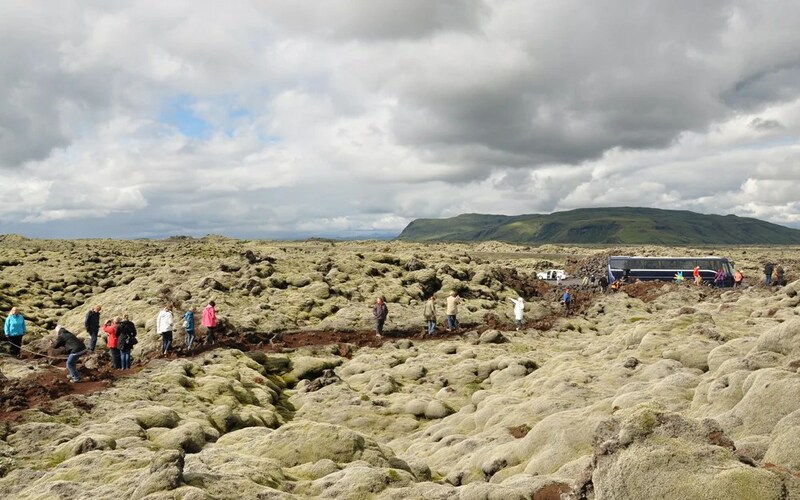 The damage occurring (excessive erosion, land degradation, loss of vegetation) within the landscape due to an overload of visitors directly threatens these values and negatively affects the experience of tourists nation-wide in Iceland. The main assignment is thus to better preserve the landscape and, simultaneously, improve the experience of people. 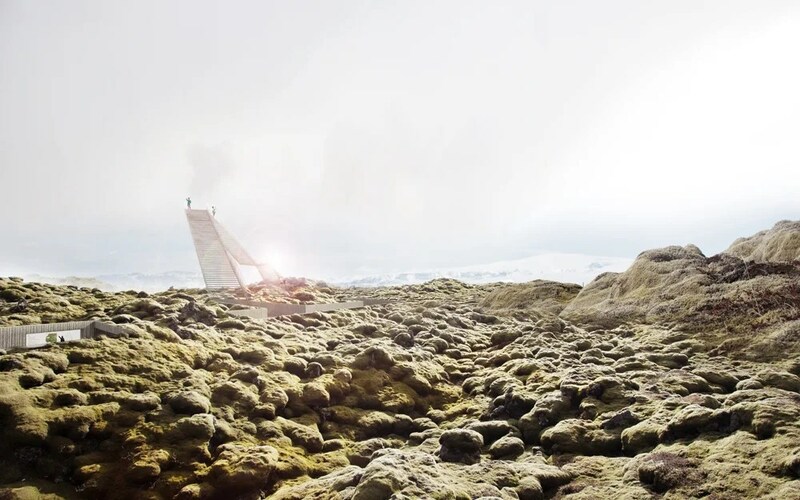 In this project a holistic vision and zoning plan was developed to achieve sustainable tourism in Skaftárhreppur municipality, south Iceland. 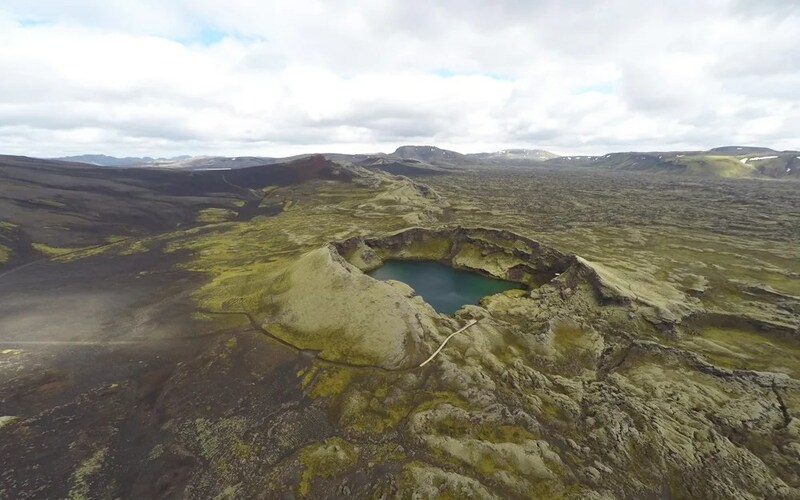 The Skaftárhreppur region offers many more different experiences than one might expect, varying from highlands, black beaches, canyon, moss-covered lava fields and pseudocraters. Within the project the different landscape types were determined, to examine how they are currently being used and what the potential, and the limitations are, from a recreational perspective. It became clear that the Skaftárhreppur landscape seems to be suffering from its own success. The popularity of the area leads to uncontrolled pressure on the landscape and a permanent footprint. The damage from excessive tourism can be seen in various ways and on different scales, from damaged hiking trails to infrastructural problems and zoning issues. The complexity and variety of the challenges necessitates a complex response, given that there are many different assignments on many different scale levels. Six principles were identified for the development of a sustainable leisure landscape in Skaftárhreppur. Cherish the diversity of the landscape and determine the carrying capacity. Perceive the landscape as both ecologically and economically valuable. Plan and design for different target groups. Introduce a hierarchy in the landscape planning. Keep the village of Kirkjubæjarklaustur alive. Make use of what is already there. Based on the different landscape entities identified, different experiences were categorized according to their suitability for different target groups. A ‘tourist’ is not simply one type of person, but requires further exploration according to the Recreation Opportunity Spectrum (ROS) and the Purism Scale model. These tools categorise tourists across a spectrum ranging from urbanists, to purists. These divisions help to identify the demands and land-use characteristics of different target groups of tourists. 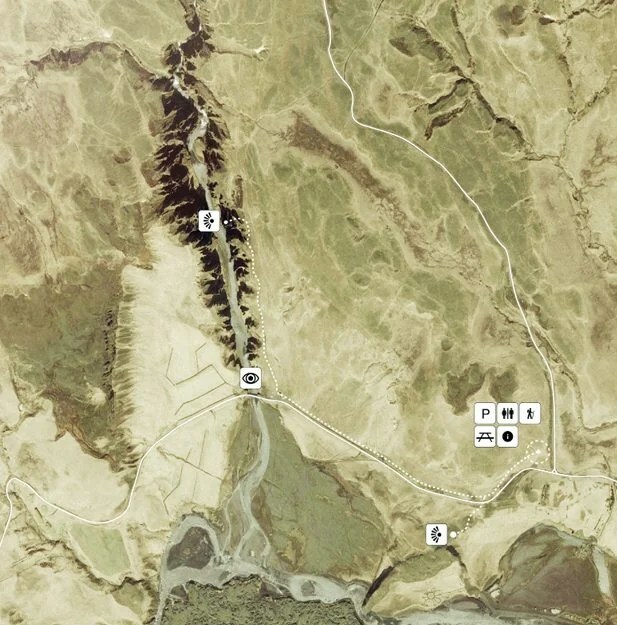 Within the zoning plan we projected the different ‘passports’ of tourists on the map, showing different experiential and development zones in the Skaftárhreppur landscape. This tool assists in determining where different experiences can be offered to visitors in the area, and what is (or should be) the level of development in that specific zone. 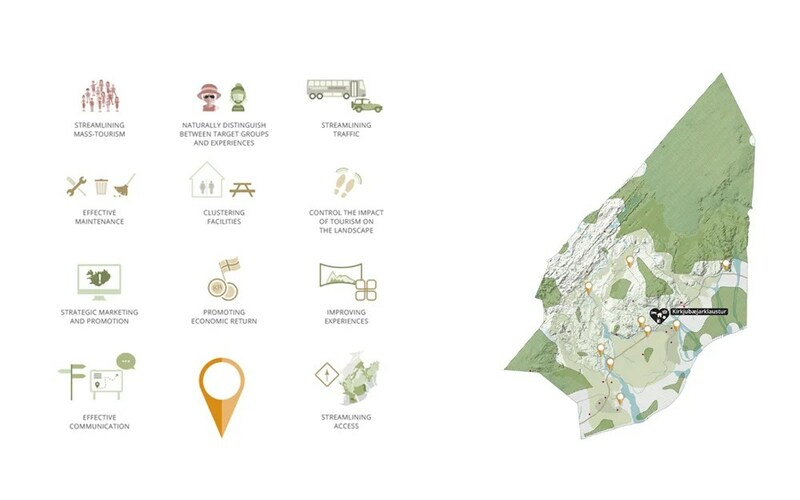 In this way, the zoning plan does not solely aim to promote ecological preservation and control future developments, but also facilitates a better connection between the expectations of visitors and the actual experience on site. Managing tourism, in the spatial sense of the word, requires strategic interventions on the highest national scale level (Iceland), the regional scale level of each municipality (e.g. concerning infrastructure, accessibility, hierarchy, focus) as well as the actual design of an attraction site. 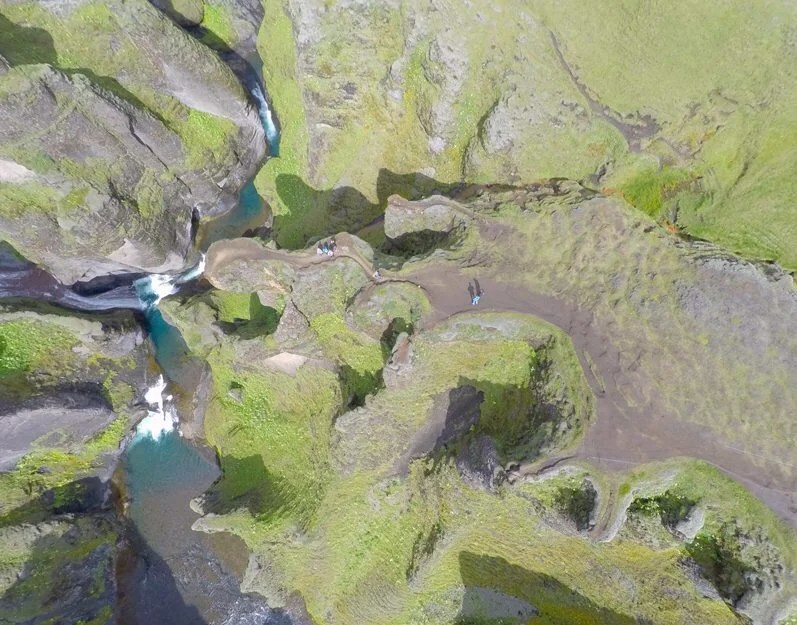 All scale levels are equally important and actively contribute to the management of flows of people and tourism in the sensitive Icelandic landscape. Currently innumerable attraction sites are being offered to tourists in the Skaftárhreppur landscape. This is causes uncontrollable and widespread damage to the landscape. Within the vision we propose to limit the amount of attraction sites and simultaneously introduce a new hierarchy, to regain control of the situation. By assigning just a few focal points (major attractions) in the area, the majority of visitors could be streamlined more effectively through the landscape. Furthermore, a strategic and considered choice on which attractions should function as focal points is essential. This determines where tourism is likely to have the most impact on the landscape and how flows of traffic through the area can be managed. This assists in better balancing recreational use with ecological values. Assigning focal points also helps to offer varied experiences to different target groups of visitors in the area. The main focal points are likely to be visited by the majority of tourists, while areas which are located more remotely from these points could offer a more ‘wilderness’ experience. Based on this philosophy five separate designs were made to show how the actual design of these focal points can contribute to better preservation of the landscape and, simultaneously, improvement of the experience of people. The project was supported by the Dutch Creative Industries Fund.